Today we’d like to introduce you to Marc Moramarco D.C.
My wife and I are Boston University grads. Neither of us are Massachusetts natives but we both loved Boston so we decided to settle here after I became a chiropractor. We had ties to the north shore and a location accessible to 93 and 95 seemed like good place to set up shop. That was 1987. For the past thirty years, I’ve had the privilege of serving the community north of Boston from Woburn. Our philosophy has always been to work hard, be available and offer healthcare of the highest standard along with the best customer service possible. We’ve been fortunate that model has always worked for us and my practice grew quickly. Life was going fairly smoothly until one January day in 2001 when my twelve- year-old daughter came down with an illness her pediatrician referred to as a ‘nasty virus’. When she was nearly recovered, I went to adjust her (perform a chiropractic manipulation) and discovered she had a significant scoliosis. As a result of the virus, she was also experiencing some hearing loss. As far as the scoliosis, I knew immediately that she was in the danger zone (approaching the levels where surgery is usually the only recommendation medical doctors make). We started out following the traditional protocols for scoliosis. Doctors recommended we try bracing but said it probably wouldn’t work. Despite the brace, her scoliosis continued to progress. Our daughter’s usual happy, carefree spirit seemed to fade away. I knew I had to find another way to help my little girl, and it had to be fast. Our family began a journey that I compare to wandering through a maze. We’d start down one path, cautious yet hopeful, then soon be at a dead end. This process happened repeatedly. I knew we were running out of time because scoliosis is best addressed before a child reaches skeletal maturity. After months of searching for leads to find an effective method of conservative treatment for scoliosis, I contacted a former chiropractic professor. After I relayed our story, he simply stated, “Go to Germany and learn the exercises.” In the previous months I had called or consulted with numerous prominent physicians, all “scoliosis experts”, asking them point blank about exercise rehabilitation for scoliosis. Not one of them ever indicated that an option existed and all of them were very negative regarding conservative treatment for scoliosis. My wife and I immediately made plans to go to Germany. The rest is history and that trip changed the course of my life. My daughter and I applied the concepts we learned in Germany on a daily basis. She improved and her spine stabilized. She avoided surgery, although we wouldn’t have opted for it anyway. Seeing the potential of the Schroth method firsthand, my wife and I knew we had to introduce it here in the U.S. for other parents and families facing the same fears and frustrations we had lived through during the previous fourteen months. In 2007, I returned to Germany to become the first U.S. practitioner to be certified in the Schroth method at the Asklepios Katharina Schroth Clinic, an inpatient facility which has treated tens of thousands of scoliosis patients over the years. I returned to Boston and established Scoliosis 3DC (3DC stands for three-dimensional correction). It’s the scoliosis division of my practice. I don’t know that any small business owner would say it’s been a smooth road. With that said, the local community has always been incredibly supportive. We are a full service chiropractic office with a unique outpatient specialty program for scoliosis using the Schroth method of Germany and a Schroth method compatible brace. I’m probably most well known locally for the treatment of low back pain, neck pain, shoulder pain and sports injuries. In the past decade, we’ve fine-tuned an efficient and effective outpatient scoliosis back school that draws patients from all over North America and five continents. My typical day starts with the more traditional chiropractic patients usually beginning at 5:30am. At some point, I switch to evaluating and instructing scoliosis patients or measure and fit braces. My colleague Amy sees scoliosis patients exclusively. I’m in the office most evenings usually until around 7:30 pm and most Saturday mornings. It’s a busy life but I’m a people person and I love what I do. My personal connection to the condition is what drives my passion to help others who are offered few options for treatment by traditional medical professionals. Many of our patients come from the west coast. Because of that, I try to get to California quarterly (I have a California license) to check on them since most of them are adolescents who I’ve fitted for a brace. Managing brace fit during growth is very important. Lastly, I’m the U.S. advanced instructor for Schroth Best Practice® and the Gensingen brace. A couple of times a year we hold a training course for practitioners who are interested in learning more about our protocols for conservative scoliosis treatment. My grandmother lived with us when I was growing up. In the old-country she was a mid-wife with many natural remedies. I credit her with having an influence on my career path, my caring nature and my tendency to look toward more conservative methods for healing. 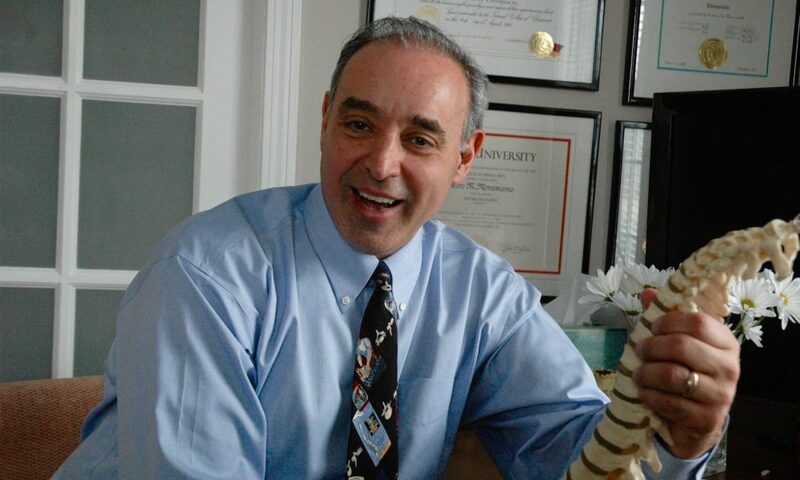 After graduating from Boston University I discovered the chiropractic curriculum and it was a perfect match for me. I was a patient of Dr Marc in 1987 and I am thrilled to see him doing so well, what a great guy!